Hello again and Welcome Back! It feels like Christmas here, as we just received a large shipment of cookware from Thailand. Kanom Krok pans, Tao ovens, condiment caddy, and more. 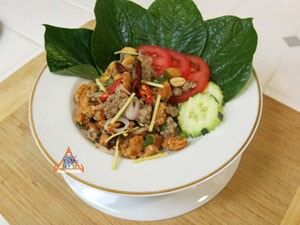 Our recipe for Khao Tod comes after a lot of research. Crispy texture and elegant flavors. One of our best Thai recipes to date. The crispy seasoned rice mixed with the other ingredients creates a blast of texture and flavor that's truly unique and magnificent. Made in Thailand of the highest quality 100% hand-carved solid granite, We just received the larger sizes (7, 8 and 9") and can begin shipping next week. Finally back in stock. Always hard to get because they're hand-poured and we only accept nearly-flawless pans. No two are the identical. Every pan is made entirely by hand in Thailand using an ancient and labor-intensive process called 'Sand Casting'. The condiment caddy is found in nearly every restaurant in Thailand, and here we have for a reasonable price the finest quality set we could find. Known in Thai as a "Puang Prik". Used for generations, this clay oven is now more efficient than ever. We're importing this from the innovator who is credited with the improved design. Mostly made by hand, we have been out of stock for about a year, and we expect to sell out fairly soon so you might want to buy one soon. Nice investment and easy to care for. Fresh, hand-poured, home-made popsicles are a rare sight in Thailand these days, and we've certainly never an ancient-style Thai popsicle maker in USA. We've imported a handful, they're fully-functional and ready to use. Some customers of ours have purchased these and end up making a successful enterprise.